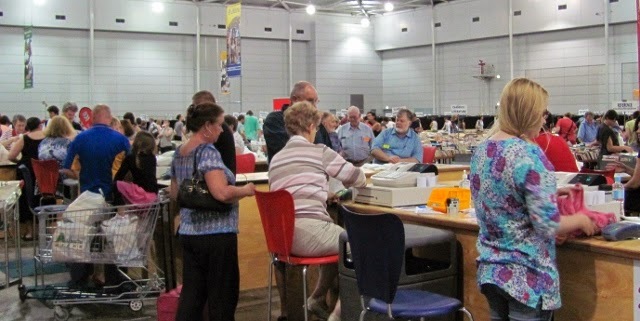 Books relevant to family history are lurking in secondhand shops, markets and book fairs. One of the best places to find them is at a Lifeline Bookfest. Bookfests are held at various times throughout the year in Brisbane, Bundaberg, Gold Coast, Ipswich, Mackay, Maryborough, Rockhampton and Sunshine Coast. The Brisbane event is held in January and June each year, in the Brisbane Convention and Exhibition Centre at South Brisbane. It's on right now and continues until 26 Jan 2015. There are three separate halls: 'High Quality (prices as marked)', '$1 Section' and '$2.50 Section'. Within each hall, books are arranged by category (Australiana; History; Biography; Reference; Paperback Fiction; Hardback Fiction; Children's; Humour and Oddities; Literature and Classics; Textbooks; Travel; Health; Science Fiction; Art and Music; Cooking; Computers; Hobbies; Sport; Gardening; Religion; Foreign Language; Vehicles and War Craft; Animals; Penguins and Pelicans; Economics; Sociology; Philosophy; Science). Each section also has magazines, stationery, videos, CDs, cassettes and records. You may want to stock up on stationery items such as ring binders and lever arch files, which sometimes cost less than a dollar. The real treasures for family historians are usually in the Australiana and History sections. Look for books about the history of regions, towns, schools, churches, businesses and organisations, and published family histories. The Reference section has atlases, street directories, medical dictionaries, and sometimes unexpected items like a complete set of The Public Acts of Queensland 1828-1936. With luck, you may find some of the titles listed on 'Suggested Reading (Genealogy and History)'. Another money-saving tip? If you are on a very tight budget, wait until the last day when the (already affordable) prices are usually reduced. I strongly advise you to bring a suitcase on wheels, as books soon get heavy when you are browsing. Local street parking is limited and fills very early. Undercover parking is available, but it costs about $16. You can travel by train to South Brisbane station or by bus to the Cultural Centre bus stop. To find out more about Lifeline Bookfests in Queensland, use the links on the Brisbane Bookfest Web page.